What are the causes of laryngitis? Laryngitis is a voice box inflammation. Laryngitis causes the voice to become hoarse. Sometimes a person feels unable to speak. 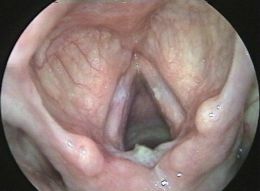 It’s a vocal cord inflammation and generally caused by infection of vocal cords. People who overuse their voice mostly suffer from laryngitis soon. Viral and bacterial infections both can cause laryngitis. Laryngitis is rarely caused by syphills, tuberculosis and fungal infection. People who suffer from laryngitis from a longer time should seek doctor for laryngitis treatment. Doctor should investigate any symptoms of cancer, if present, as it may sometimes proves cancerous. Smokers mostly suffer from the risk of laryngeal cancer and should undergo a thorough medical treatment for any complications of larynx.